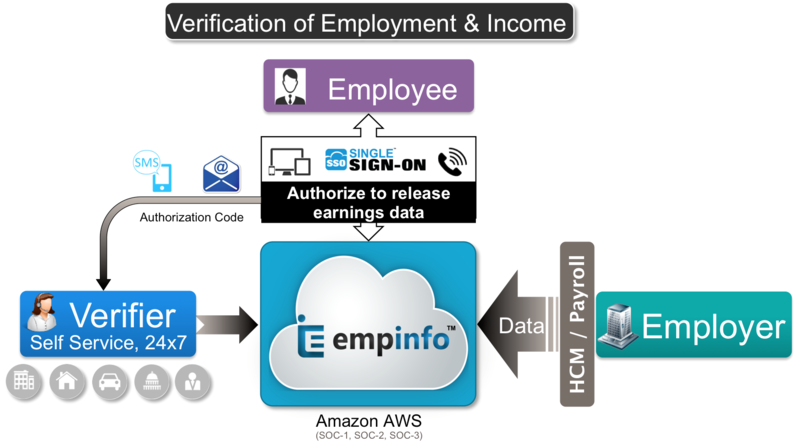 EmpInfo was founded in 2011 in Silicon Valley, offers a totally automated solution (SaaS) to help employers with employment & income verification challenges. It reduces the administrative burden for HR/Payroll and the risk of dealing with unknown third party verifiers, saves operational costs, minimizes corporate liability and also results in greater employee satisfaction. Authenticated verifiers can verify employment history and income data for current or former employees, online (24×7), securely & instantly. EmpInfo pioneered a new level of security and automated process to deliver a self-service solution on modern web/mobile/IVR interfaces. The access to employment records are strictly limited to the authenticated verifiers as per Fair Credit Reporting Act (FCRA) compliance, protecting employee’ privacy. Unlike our competitor, we offer superior services with integrity and committed to maintain confidentiality for ever!